If you’re a business owner, entrepreneur, expert, speaker, author, coach or consultant who would love to create marketing materials that attract, inspire and invite your ideal prospects to become ideal clients without sounding hype-y or sales-y, then this book may be exactly what you’ve been looking for. In Michele’s first book, “Love-Based Copywriting Method,” she walks you through the philosophy of love-based copywriting and explains why traditional copy and marketing feels so icky. 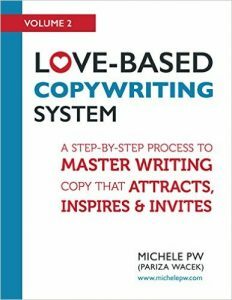 In this book, “Love-Based Copywriting System” she rolls up her sleeves and walks you though her exact system for writing copy that converts without feeling sleazy. You’ll discover exercises, examples, templates and more — in fact, it’s designed to be a “copywriting course in a book.” You’ll get detailed, step-by-step teachings of everything from headlines to features and benefits to presenting your offer and more, so if you follow along and complete the exercises, by the end of the book, you’ve got your copy created. Get it on Nook or paperback at Barns & Noble.